I took advantage of the name of this quilt block -- Sunshine -- to choose my colours. And ... since we all need a little sunshine in our lives, I thought the brighter the better. 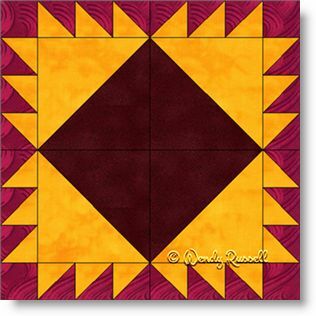 This four patch quilt block is made of simple shapes -- only the square and the half square triangle patches. However, due to the number of pieces needed to create this wonderful quilt block, I have designated it as an intermediate level of difficulty. By taking your time and paying careful attention to the precision in making your quarter inch seam allowances, you will construct a perfect block in no time. The sample quilts illustrated give you ideas on how to lay out your quilt blocks, with or without sashing. Enjoy!